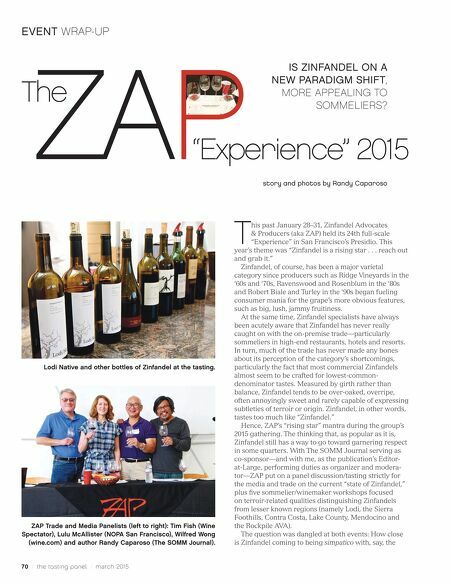 70 / the tasting panel / march 2015 ZAP EVENT WRAP-UP T his past January 28–31, Zinfandel Advocates & Producers (aka ZAP) held its 24th full-scale "Experience" in San Francisco's Presidio. This year's theme was "Zinfandel is a rising star . . . reach out and grab it." Zinfandel, of course, has been a major varietal category since producers such as Ridge Vineyards in the '60s and '70s, Ravenswood and Rosenblum in the '80s and Robert Biale and Turley in the '90s began fueling consumer mania for the grape's more obvious features, such as big, lush, jammy fruitiness. At the same time, Zinfandel specialists have always been acutely aware that Zinfandel has never really caught on with the on-premise trade—particularly sommeliers in high-end restaurants, hotels and resorts. In turn, much of the trade has never made any bones about its perception of the category's shortcomings, particularly the fact that most commercial Zinfandels almost seem to be crafted for lowest-common- denominator tastes. Measured by girth rather than balance, Zinfandel tends to be over-oaked, overripe, often annoyingly sweet and rarely capable of expressing subtleties of terroir or origin. Zinfandel, in other words, tastes too much like "Zinfandel." Hence, ZAP's "rising star" mantra during the group's 2015 gathering. The thinking that, as popular as it is, Zinfandel still has a way to go toward garnering respect in some quarters. 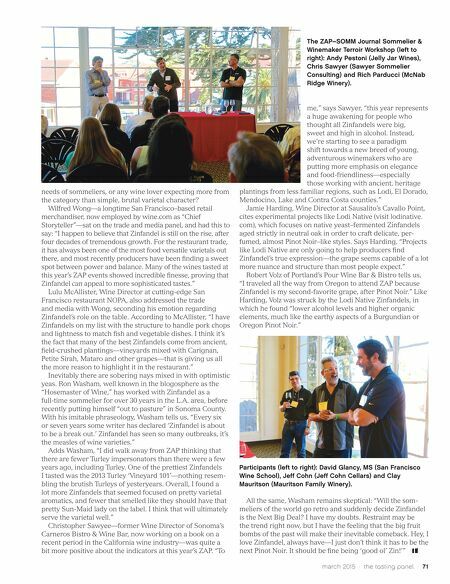 With The SOMM Journal serving as co-sponsor—and with me, as the publication's Editor- at-Large, performing duties as organizer and modera- tor—ZAP put on a panel discussion/tasting strictly for the media and trade on the current "state of Zinfandel," plus five sommelier/winemaker workshops focused on terroir-related qualities distinguishing Zinfandels from lesser known regions (namely Lodi, the Sierra Foothills, Contra Costa, Lake County, Mendocino and the Rockpile AVA). The question was dangled at both events: How close is Zinfandel coming to being simpatico with, say, the "Experience" 2015 The IS ZINFANDEL ON A NEW PARADIGM SHIFT, MORE APPEALING TO SOMMELIERS? story and photos by Randy Caparoso Lodi Native and other bottles of Zinfandel at the tasting. ZAP Trade and Media Panelists (left to right): Tim Fish (Wine Spectator), Lulu McAllister (NOPA San Francisco), Wilfred Wong (wine.com) and author Randy Caparoso (The SOMM Journal).